How Big Were the Longboats that Attacked the Gaspee? Webmasters note: This article is reposted with permission from the Joseph Bucklin Society web pages at: http://www.bucklinsociety.net. It is fascinating not only for its content (which admittedly beats to death one single item of Gaspee minutae), but more for the deductive reasoning (or what Bucklin calls forensic reconstruction) displayed by one of the Southwest's foremost courtroom attorneys. For specific references to the Gaspee testimony recounted in this article, see Staples, The Documentary History of the Destruction of the Gaspee elsewhere on the Gaspee Virtual Archives website. One opinion is that the "longboats" of the Gaspee attackers were larger than commonly used in recreations today of the Gaspee attack. The opinion is based on the following reasoning. Several lines of reasoning lead to an estimate that the Gaspee raiders used long-boats well over 20 feet long and easily capable of holding at least 11 to 15 men. 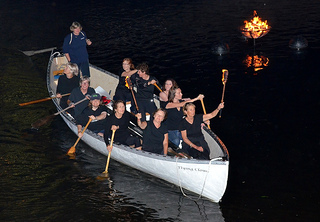 An example of the type of long-boat probably used is the boat shown in the thumbnail on the right, which is well over 20 feet long and is shown with 11 persons in it. We all start with the description given by Bowen: "Mr. Brown immediately resolved on her destruction, and he forthwith directed one of his trusty shipmasters to collect eight of the largest long-boats in the harbor, with five oars to each..."
This 18th century description is a strange description to modern city dwellers, because "five oars" is an odd number, not an even number of oars, and we assume that rowing takes an even number of oars. At first one perhaps thinks that Bowen wants to tell us that the fifth oar was used for steering (which does not make much sense because long-boats steered by a tiller, as was often the case, would be better for the purpose of the attack). Then we think that Bowen wants to tell us the fifth oar was to be a spare. (That does not make much sense, because the persons whom he was addressing really would not care whether a spare oar was carried). And since we do not know by experience what an ordinary long boat of the day was, we cannot picture in our mind the size involved, so "largest" doesn't seem to help us much without some further digging. Most of us today stop after reading Bowen's description and do not spend time thinking about what it means. "Five oars" does say something about the size of the boats if the audience is composed of 18th century persons familiar with ship's boats use, and, on close examination, Bowen's "largest" description does tell us even more about the size of the boats. In the 18th Century, the nautical term of "oars" when describing a boat, could mean either "single oars" or "pairs of oars". For an example of the use "oars" to mean "pair of oars", see the Table of Boats carried by British vessels of war by William Mountaine, The Seaman's Vade-Mecum (London, 1757). British warships carried a variety of small boats, for different purposes. Mountaine describes the oars of the various "Long Boats" as e.g., "7 oars" or 8 oars" Yet, if you look at the same type of long-boats in the British Navy drawings, you will see the oars set out as "7 Pair" or "8 Pair". E.g., "18th Century Longboats After Chapman", at Notes on 18th Century Ship's Boats, Vol. 26, Nautical Research Journal, p 209 et seq. (Nautical Research Guild, Washington, D.C., Dec., 1980). It is at least equally probable, just from the use of the term alone, that Bowen was describing long-boats that had what we would call "five pairs of oars". What we can deduce from the necessary size of a rowed boat with 5 pairs of oars is a boat that has at least 3 feet of length for each set of oars. Therefore, considering some room at the bow and some at the stern, in addition to the space for 5 seats for rowing, the longboats must have been in excess of 18 feet long. This estimate of the minimum size of the longboats (calculated from a meaning of "five pairs of oars") of which Bowen was speaking, fits with Bowen's adjective "largest" in "largest long-boats", if we examine the usual size of a long-boat of the day. William Falconer, in Universal Dictionary of the Marine (London 1789) defines types of boats as the terms were used in the 18th Century, and defines a "longboat" as: the largest boat that usually accompanies a ship, and is generally furnished with a mast and sails, and further describes the longboat as what is common to a merchant-ship. See the accompanying diagram of a "6 Pair" of oars longboat of the 18th Century. (Click to enlarge the thumbnail.) Note it is 22 feet long and over 7 feet wide. Likewise, the U.S. Tables of Allowances for the outfitting of our Naval ships at the beginning of the 19th Century, providing for various boats for the ships, are instructive. 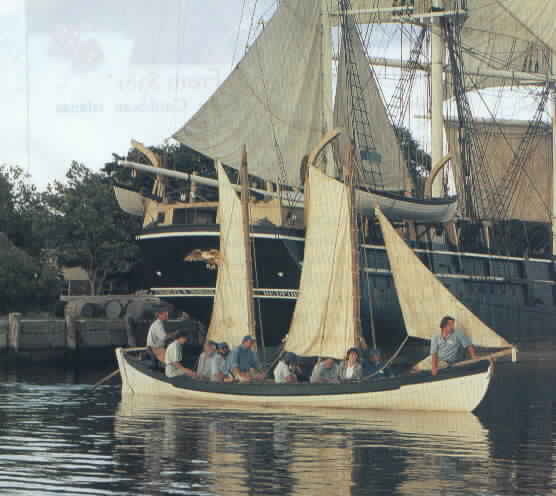 The sloops and brigs had accompanying boats of from 21 to 30 feet in length. See Vol. 31, Nautical Research Journal, p 47 et seq. (Nautical Research Guild, Bethesda, MD 1985). Again , this suggests that Bowen's "largest long-boats" were easily in excess of 20 feet long. Bowen's account suggests that the his seat was wide enough for another person to be in the middle (not rowing): "I took my seat on the main thwart, near the larboard [left hand side if facing forward in a boat] row-lock, with my gun by my right side, facing forwards. As soon as Dudingston began to hail, Joseph Bucklin, who was standing on the main thwart by my right side,...."
The persons rowing necessarily cannot be tight against the outside of the boat if there is to be any effective rowing. A rower needs a two to three foot width of room to row. Two rowers with enough room for a third man to stand on the rowing thwart yields a width of 7 feet or so. The attacking force clearly impressed the Gaspee officers and men as being overwhelming is size. Their estimates were well over a 100 attackers. (E.g., Dickinson said that in the three boats that initially boarded there were 30 or 40 men, and there were a total of 150 that eventually boarded. (The Gaspee's sentinel, Bartholomew Cheever, estimated "about 200.") Granted that the testimony at the court martial would have emphasized the need to surrender to a superior force. But the fact is that on the night in question, the English felt overwhelmed, and these are the only estimates of the size of the attacking force. For such a large force, large long-boats were needed. Again, this suggests that Bowen's "largest long-boats" were easily in excess of 20 feet long. John Mawney referred to the long-boat on which he rode as a "barge". "Barge" was used for two types of boats associated with larger ocean going ships. An admiral or other high ranking naval officer has on his flagship a "barge". The barge was a large and imposing boat, and was used to carry the ranking officer to/from his command ship. It is not the flat bottomed scow that we think of in the 21st Century. The other 18th Century meaning of "barge" was for the large type of long-boat used to carry goods to and from a ship at anchor and the shore. Both meanings of the "barge" term used by Mawney indicate a large vessel. It also is consistent with his story of sitting in the stern with the boat captain and still being able to "spring forward" the length of the boat to be the first in his boat to grab a rope and get aboard the Gaspee. Obviously, Mawney had room to move between rowers to get forward, so this was not a small boat. "During the time they were rowing me on shore, I had an opportunity of observing the boat, which appeared to me to be a very large long-boat. I saw by the man who steered her a cutlass lying by him . . . .One man, who had a little more humanity than any of the rest, said they had better land me at the Point of Pawtuxet. As I was unable to stand, they unbound five of the men and gave them a blanket to carry me up." This description was an attempt by Dudingston to help the investigator discover the attackers' identity, and he was apparently trying to be accurate. Dudingston was experienced in the English navy, which regularly had longboats in excess of 25 feet long on even their smaller ships. Dudingston did not describe the boat as a pinnacle, a yawl, or any other kind of smaller rowed boat which were 15 or less feet in length.. He called it a long-boat, and did not rest on calling it a long-boat or a large long-boat. His description of "a very large long-boat" suggests that Bowen's "largest long-boats" were easily in excess of 20 feet long. Likewise, note that there were more than six English men (inferred from Dudingston saying "they unbound five of the men" ) being rowed by the attackers, and what Briggs described as Dudingston laying in the boat behind the space for all the rowers, so this boat must have been substantial in size. In short, Dudingston's description indicates a boat much longer than 20 feet and more than 4 single oars rowing. Dudingston said that he had called for Dickinson to be brought to him in the ship's cabin as Dudingston was having his wound attended to, so that Dickinson could help to identify the attackers. Dickinson testified that he counted seven "launches and merchants ships boats" with "about one hundred and fifty" men. (Note, Dickinson uses "launch". A "launch" was a sloop- rigged large boat , used by English warships in landing marines for amphibious warfare, a tactic King George favored. The "launch" and the "barge" were the biggest of the ship's boats carried by English warships.) Dickinson clearly wanted to tell the investigators that these 7 boats, with 150 men in them, were large long-boats, easily able to handle 20 plus men in each boat. 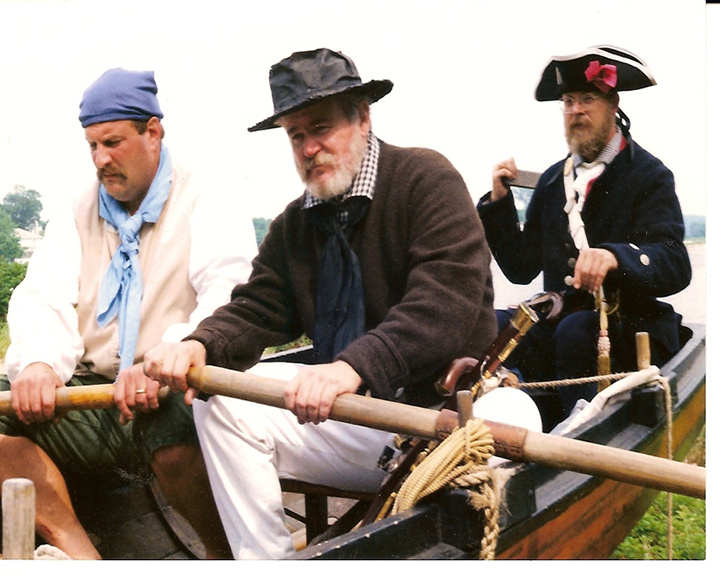 Left: The re-created 16 foot longboat Genevieve used in Rhode Island re-enactments and parades is typical of boats constructed during the Revolutionary period, albeit probably much shorter than ones used to attack the Gaspee. Right: Typical crew dress of the time. Click on images to enlarge. Potter's boat was described by Briggs as: "....he was in a boat which was rowing with eight oars; that the time he met the said Potter was about half an hour after he, this deponent, left the island, and he, said Potter, was about five miles from Bristol; that there were eleven men in said boat." Briggs was impressed by the Potter group to row. Whether Briggs was to use an additional available oar or was to give relief to the rowers, the fact is that Potter's boat had at least four sets of oars, maybe more, was probably in excess of 28 feet, and was fully able to hold 20 men. If Potter had a 28 foot long-boat, did Brown? Brown had a sizable fleet of merchant ships engaged in the slave and sugar trades, and Providence was a town with a number of ships available in the harbor. Fifty whaling ships made Rhode Island their home base, bringing back spermaceti, the raw materials for Brown's candle making factory. It is doubtful that Brown in Providence had only smaller long-boats than available to Potter in Bristol. So, our conclusion is that Bowen's description of "largest long-boats in the harbor" tells us of boats in excess of 25 feet in length, and most probably with 10 men rowing them (five pairs of oars). Vice Admiral Samuel Graves, R.N., at Boston in July 1775 and under constant harassment from raiders in whaleboats — who set fire to Boston Lighthouse which is at present rendered useless and who were robbing the islands and burning the Houses and Hay thereon (which) most certainly distresses the Garrison — made a very succinct case for utilizing whaleboats: "from their Lightness and drawing little Water, they can not only out-row our Boats, but by getting into Shoal Water, and in Calms, they must constantly escape." He might have added that with a proper rig they could also sail very well. Whaleboats were made of oaken keels with lap-strake cedar clapboards about one half-inch thick and, while extremely sturdy, were so very light that two men can conveniently carry them, though it would have taken several stout hands when the boats were loaded and the wood had made up." They were generally meant to be conveyed aboard whaling sloops and brigs and were probably about the size of Thomas Wickham's 21 Feet 8 inches Keel, which Rhode Island had taken into state service in October 1777." Double-enders, unequaled in fine lines and powerful form, were preferred by most whaleboatmen because they would back off smartly when a whale was harpooned, rather a necessity if the boat was not to be upset, were easier to build and were acknowledged by many to be more seaworthy than square-sterned boats since the gunwale amidships rises with an accelerated curve at each end, and this rise of bow and stern gives it a duck-like capacity to top the oncoming waves, so that it will dryly ride when ordinary boats would fill. These whaleboats could be rowed with four, five or six oars and will make ten miles an hour in dead chase by the oars alone." John Brown wanted 3 Wale boats for a Brigg that's going Wailing to the Western Islands — 2 of them to be 6 ored & I of 5 ores." The Boston Newsletter (12 February 1730) spoke of a whaleboat's crew as Stersman, an Harpineer, and Four Oar Men. 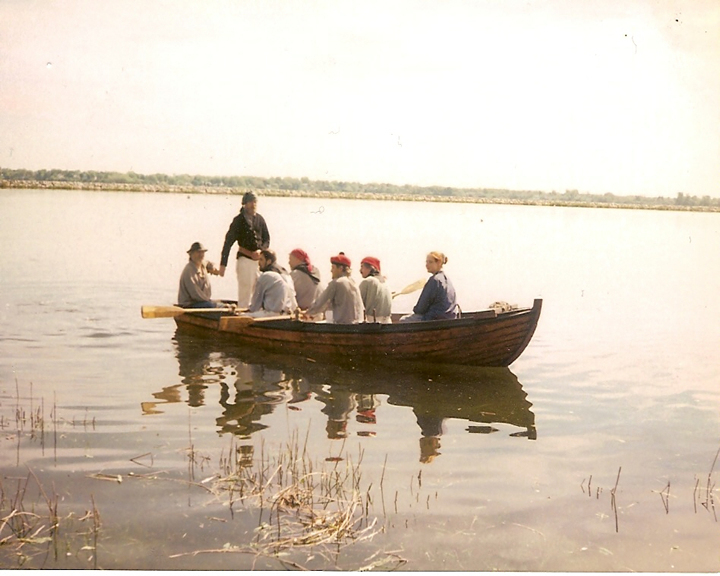 The five-oared whaleboat, with oars of varying lengths, was somewhat unique to North America, …. though the evidence seems to indicate that military people and privateersmen favored the six-oared boat with about nine or ten men aboard. Long whaleboats, with twelve to sixteen oars, were also very much in vogue both as raiders and express boats. Fitted with sails and with swivels, and on occasion with a small carriage gun, perhaps a 3-pounder, the British used them to shuttle dispatches between Yorktown and New York during the military crisis in September and October 1781. …Whaleboats had been exceedingly popular in pre-Revolutionary times both as fishing boats and small coastal haulers.